State of the IT Industry 2009 Contest – Win an mp3 player! Last week I posted an article on the front page of theforcefield.net revisiting a series of podcasts about The State of the IT Industry in which four IT professionals predicted where their business and the industry as a whole would be in the coming year. The idea is to find out if their predictions were true, what happened in their segment of the industry that made them come true in spite of current economic conditions and why. Of course, not everyone has had the same optimism or success in their businesses, which brings up an interesting point. Why did some do well and others didn’t? I think there are a few reasons but there is one in particular that was discussed in all four episodes that became a common theme. Hint: It was discussed outright in episodes 31 and 32. At the end of the article I challenged everyone to review the episodes for themselves and discover what I believe to be one reason discussed that can make or break your success in this market, especially in a difficult economy. To find out if I’m right and what it is, we are holding a contest. I invite everyone to listen to all four interviews again and post your comments in The Force Field Forums or send an e-mail to comments@theforcefield.net. If you guess my answer correctly or figure it out I will put your name in a drawing to win an mp3 player similar to the one we gave away in the Summer of Podcasts contest earlier this year. (The winner was in Sweden). This mp3 player will be shipped loaded with The Force Field Podcast Special Edition Volume 1. This edition, which is currently available in The Force Field Podcast store, is a collection of the first six episodes of The Force Field (when it was for OnForce Providers only) remastered with additional content and an additional segment in each episode written and produced specifically for the collection and never before released. The episodes are COMMERCIAL FREE. Post your answer in the forum contest thread or via e-mail. You may discuss the topic in the thread but only one official posted answer per entrant. You must include a valid name/username or e-mail address in the post (you can spell out (at) instead of @ to prevent spamming. If you use username only make sure the e-mail address on your member account is correct. A winner will be chosen from all correct entries posted in this thread or received by January 31, 2010. The winner will be announced on a future episode of The Force Field. The State of the IT Industry 2009: Looking back, were we right? Earlier this year we ran a four-part series on The Force Field podcast called The State of the IT Industry, a comprehensive study of the effects of national economy in a downward trend on the IT services industry. During this series we interviewed four service professionals and asked them how their businesses were doing and where they thought the industry would be in the coming months. Given the situation with banking industry, high unemployment and a world economy on a downward spiral their answers were somewhat surprising. Overall, they were very optimistic. In episode 29 we talked with Pat Palmer of The Computer Guy, heard how his business is doing well in spite of the economy and how he expects this trend to continue in the months and years to come. In episode 30 we talked with Kris Crispell, a computer consultant in Oregon and he told us the same thing. In episode 31 we talked with Crisantos Hajibrahim of Virus Woman. He told us why he entered a new and growing area of the IT market to keep his business profitable, heard how he did it and found out how he is riding out the economic storm with Google Apps. In episode 32 we wrapped up the series with The VAR Guy, listened to his advice on diversifying and found out where he thought the industry is headed. They represented four different segments of the industry with four different business models. Yet their views were the same: they all were very optimistic about where their businesses were going, in spite of the economic situation. I wanted to revisit this at the end of the year and find out if their expectations were met or exceeded, or if they had all been overly optimistic. A general look at the current state of the industry indicates that, overall, IT has fared well, especially compared to other industries, and this trend is likely to continue, at least for awhile. In fact, I received a number of comments from other IT providers who seemed to support this observation. For instance, at the start of an interview in a recent episode with Pat Palmer, who returned to discuss business plans, I asked the follow-up question, “How has business been since then? Is it about what you expected?” The short answer was yes. In fact, in July of this year he expanded his business, opening a retail storefront downtown. I received a number of other comments from service providers as well, most were similar to those above. Not everyone agreed, however. There were a few who said business was about the same or slower and one or two said they were getting out of the business entirely, though not necessarily due to the economy. Interestingly, this general spike in business for IT is in stark contrast to the last major economic upset which occurred in 2001 – after 9/11. At that time the industry took a serious hit and it was somewhat slow to recover. What happened? How did the industry escape a fate in 2009 it endured eight years earlier? What changed between then and now that made IT more resilient to such an economic downturn? Personally I believe it has more to do with our society and our increased dependence on technology than anything else. During the past decade we have become more reliant on a high tech infrastructure in nearly all facets of our existence, from computer controlled electrical grids, utility delivery systems, transportation, communications and national security to business operations, domestic activities and personal diversions. We now have devices, tools and processes that either did not exist ten years ago or were luxuries that became commodities on which we rely heavily for both domestic and commercial use today. What was considered a novelty then is now almost a necessity. When it fails or breaks, it needs to be fixed or replaced pronto. Such is the state of the IT service industry in 2009. It is no longer just another field, it is one that has become increasingly vital to the maintenance and perpetuation of our entire societal infrastructure. The economy may be bad, but without IT, it could become worse. While that may answer the question as to why the industry as a whole survived and flourished, there is still the question as to why most service providers did exceedingly well and others didn’t. To answer that question, I went back to interviews and analyzed them from another perspective. I listened to the series again (yes, I listen to my own podcast!) and found a common denominator among the responses from all four guests. Yes, their views were all positive and optimistic. Why? What was the common element here that made them optimistic and sure of their success? I think I know the answer, but I want to know if it is indeed the one thing that made the difference. To find out if I’m right and what it is, I invite everyone to listen to all four interviews again and post your comments here, in the forum thread The State of the IT Industry 2009 – Win an mp3 player! or send an e-mail to comments@theforcefield.net. If you guess my answer correctly or figure it out I will put your name in a drawing to win an mp3 player similar to the one we gave away in the Summer of Podcasts contest earlier this year. (The winner was in Sweden). I will give you a hint: there are clues in each episode and it was actually discussed outright in episodes 31 and 32. When I ‘closed’ my first M&S agreement (maintenance & support), I thought I finally figured it out, and if I could sell enough of them, our business would making the American Dream come true. That was 10 years ago. After an intense 24 hours the New and Improved Force Field Forums are now online! The new forums incorporate the latest stable version of Simple Machine Forum and new features to enhance the forum community experience. This migration was not without its challenges, however. Originally the outage was scheduled for four hours but numerous technical snafus and data migration issues forced them offline for almost a full 24 hours. The Force Field forums were scheduled to go offline last night, December 15, 2009 from 8 PM to 1 AM EST for upgrades. Due to activity the outage was delayed for an hour to ensure all the data from the new activity would be backed up before the migration. The planned migration to a new forum called Kunena failed on a test site and prompted an eleventh hour (literally 11 PM) decision to use another forum already chosen in case Kunena did not work out. During this time members were not able to access, read and post in the forums but were able to access other areas of the web site as the initial migration was performed on another test site. The second forum required a database conversion that also failed on the test site. After several attempts a manual conversion process was performed this afternoon and after testing the database and forums were moved to the production site. Although great care was taken to preserve the data, some posts and settings may not have transferred successfully. In addition, some logins may not function properly and it may be necessary to change login passwords. If you do encounter an issue logging in, please click "Forgot Password" on the forum login screen and a new password will be sent to your e-mail address on file. The new forums will resolve old bugs and introduce new features to enhance The Force Field forum community experience. As these new forums are a separate component of the site and no longer integrated into the rest of The Force Field, The login function on the front page of theforcefield.net will no longer automatically log you into the forums. The forums require separate registration and login from the rest of the site. If you have any questions or trouble logging into the new forums please contact an administrator or e-mail forums@theforcefield.net. You can access the forums from the Forums link in the menu on the left sidebar or at http://www.theforcefield.net/forums . Please sign up for the webinar that is going to be hosted next week. Will not cost you a penny but i’ve reviewed the material that is covered and well worth the 30-60 mintues of time that it takes. Look forward to seeing everyone online. The Force Field forums will go offline tonight, December 15, 2009 from 8 PM to 1 AM EST for upgrades. The new forums will resolve old bugs and introduce new features to enhance The Force Field forum community experience. During this time members will not be able to access, read and post in the forums. From time to time members may not be able to access other areas of the web site as well while we complete migration. We will do our best to minimize the interruption but it is possible certain portions of the site such as the IT Business Resource Directory and Marketplace may also be affected. The podcasts episodes should not be affected by the upgrade. During migration you should still be able to access, download and listen to episodes of The Force Field podcast at http://www.theforcefield.net/wordpress . The entire site, including the forums should be available after 1 AM EST tonight. As part of the World’s Shortest Webinar Series, veteran data center manager and monitoring guru, Steve Francis, will demonstrate LogicMonitor’s configuration-free Netscaler Monitoring system. 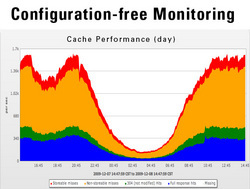 The online demonstration will give datacenter managers the opportunity to see how in-depth monitoring can be configured from start-to-finish in a matter of minutes. Santa Barbara, CA (Vocus/PRWEB ) December 9, 2009 — As part of the World’s Shortest Webinar Series, veteran data center manager and monitoring guru, Steve Francis, will demonstrate LogicMonitor’s configuration-free Netscaler Monitoring system. The December 17th online demonstration will give datacenter managers the opportunity to see how in-depth monitoring can be configured from start-to-finish in a matter of minutes. The company will offer webinar attendees a complimentary 21-day trial of LogicMonitor’s Netscaler monitoring service. With LogicMonitor, configuring a load balancer for monitoring is as simple as entering its hostname — no additional configuration is needed. The system then automatically discovers all content switching VIPs, active interfaces, load balancing VIPs, etc., saving IT managers hours of time. The LogicMonitor service revolutionizes monitoring by providing more metrics, and presenting them all in intuitive visual format, so trends can be easily spotted. “We managed datacenters for ASPs and Enterprises for over 15 years. During that time, we were never able to find a monitoring system that delivered what is really needed in the trenches by a web-focused company. So we built it ourselves,” stated Francis. Headquartered in Santa Barbara, California, LogicMonitor LLC was founded by a team of datacenter managers and technology experts dedicated to making datacenter monitoring simple.